What was the outcome of the Curated Walls Beta Project? 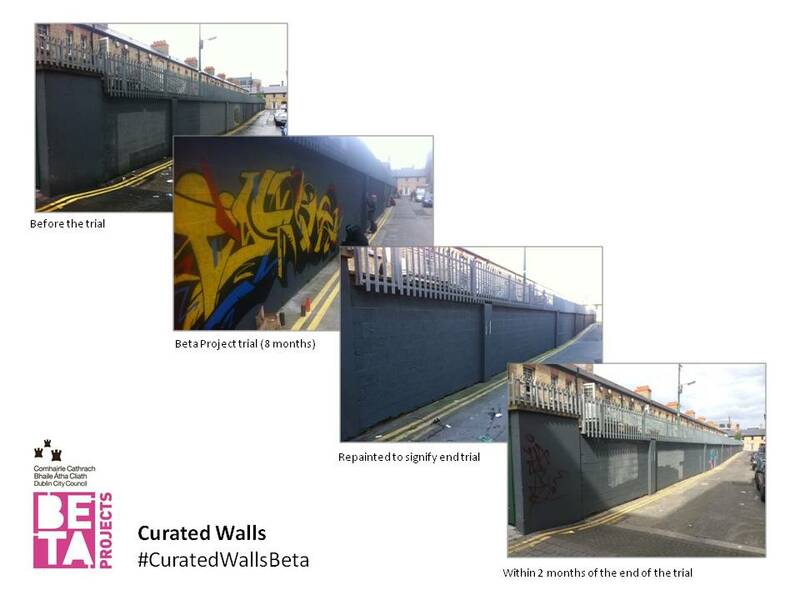 Please use the hashtag #CuratedWallsBeta on social media to help us and everyone else follow the conversation. Once a suitable policy has been adopted by Dublin City Council, this idea will be available for rolling out (as required) across Dublin City. It’s not directly related, but this TV conversation about street art walls in Dublin mentions the above trials and touches on some of the outcomes and recommendations also seen in the Report Card above. Would you like to paint a wall? If you’re interested in being kept up to date with any further news on this, or possibly painting or curating a wall at some stage, you can register your details here! This entry was posted in 2. Environmental, 3. Moving About, Beta Project macro, Paul, Shane, Siobhan, Street Art and tagged report card, street art. Bookmark the permalink. How about inviting internationally renowned artists to Dublin to show their art on highly visible walls. It would really brighten up the place and put the idiot taggers that are all too common in the city to shame.